Eggs laid by the world’s most venomous spider have been discovered in a batch of bananas at an English supermarket, causing the store to be temporarily shut down. The Aldi store in Nuneaton was closed Thursday night after eggs laid by a Brazilian Wandering Spider were found in a bag of bananas. The adult spider, however, was nowhere to be found. “If you weren’t able to get anti-venom within those six hours, it can lead to paralysis and in some cases it can lead to death,” he warned. Geoff Grewcock, manager of the nearby Warwickshire Wildlife Sanctuary, told the paper: “We had a call from the family who had bought the bananas from Aldi and there was a clump of eggs in there. In 2005, a British man spent two weeks in the hospital after a bite from one of the spiders. Another was discovered in a warehouse in Coventry just a week ago. On Thursday a deadly Black Widow spider was found in a box of grapes in Leamington Spa. 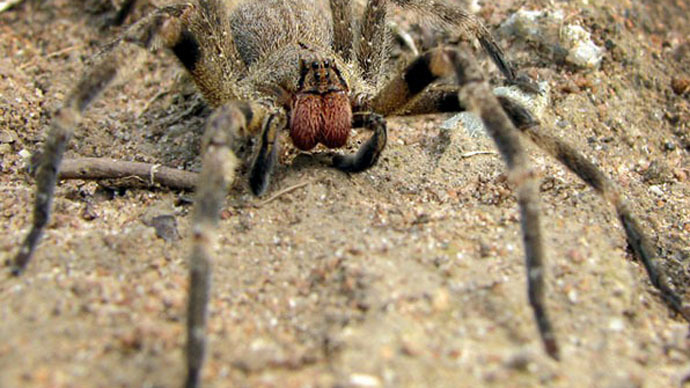 The Brazilian Wandering Spider has been listed in the Guinness Book of Records as the most deadly in the world since 2010, but the availability of anti-venom means bites are not usually fatal, if treated in time. Spiders aren’t the only deadly tourists that could soon be found in Britain. In April, Britain’s top bee specialists called a “council of war,” warning a species of Asian hornet with a chilling reputation could arrive in Britain with deadly results in the near future. Millions of the beasts, which at three inches long dwarf the UK’s native hornets, were said to be heading across Europe because of the early, hot spring. They have already been blamed for six deaths in France, and have also been found in Spain and Portugal.